Colombian students and professors have been on strike for several weeks, in some universities for even longer. As many as 60 public and private institutions of higher education have signed on to the list of demands that was presented to the government and congress last September 27 by the National Union of Students in Higher Education (UNEES). The key demand is that the national government increase funding for public education. The students are also preparing for another major mobilization on November 8. On November 6, the first round of negotiations was held between the national government and representatives of UNEES and other student organizations. The objective was to discuss the crisis in higher education in the country and specific points on the UNEES’ list of demands, such as the resources needed by public universities and the 2019 budget for public higher education. Also present at the discussion were the office of the inspector general, the office of the comptroller general and Alberto Brunori of the office of the United Nations High Commissioner for Human Rights. Negotiations were suspended after the Government refused to compromise on increasing the financial resources towards public universities and technological institutions to resolve the massive deficit the institutions have for 2018. Resolving the 2018 deficit has been a central demand of the students and faculty. Student leaders have called for the movement to increase the pressure on the government and intensify the mobilizations. 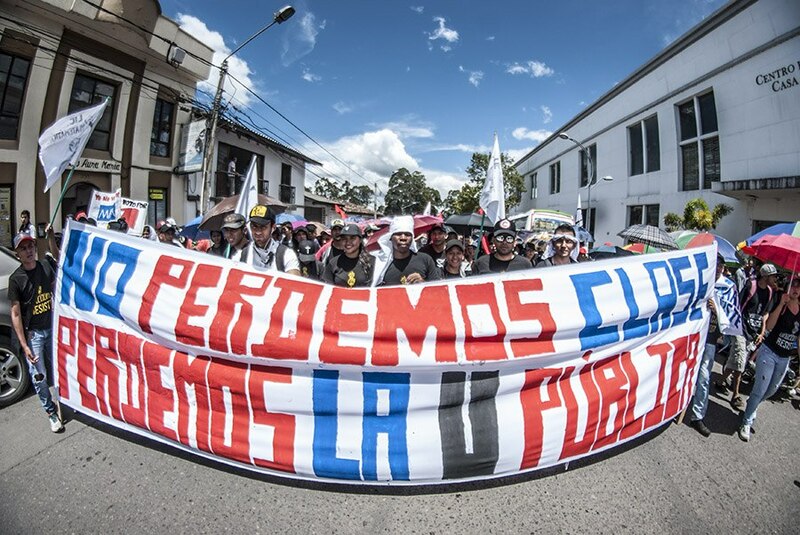 The negotiations are not a result of the government’s goodwill but the outcome of sustained, creative and strong mobilizations carried out by students, professors and faculty. Across the country, students have used a wide diversity of tactics to draw attention to their demands, which is characteristic of the student movement. On Halloween, students in cities across Colombia participated in massive ‘zombie marches’, showing the ‘death’ of public education. On some campuses, there were “kiss-a-thons” for public education. In several universities, students, professors and faculty members participated in hunger strikes to demand that the government engage in negotiations. For example Adolfo León Atehortúa, the former president of the National Pedagogical University and current professor in the faculty of humanities, was on a hunger strike for nine days to demand that the ministry of education initiate dialogue with the student movement and address their demands. Students have also occupied key installations of their universities. The steady and consistent level of mobilization on a national level has been key to the movement advancing with their demand. The mobilizations have also been met with heavy repression by Colombia’s public force, specifically the Anti-Disturbance Mobile Squadron (ESMAD). This force was created to repress protest and since its creation in 1999, has been at the center of human rights violations, including the assassination of a student protester Jhonny Silva at the Valle University in 2005. Despite legally not being allowed to enter university campuses, ESMAD has entered several different campuses during strike activities to repress the students. The following video shows them forcibly entering the University of Nariño and shooting tear gas at students. Ahead of the discussions between the government and the student movement, president Ivan Duque held talks with the presidents of 32 public universities in Colombia to discuss the budget crisis. Their agreement was rejected by the student movement not only because the proposed budget would not be sufficient, but also because it completely excluded the voices of the student and professors who were on the streets and articulating proposals and demands. The university presidents have also been asking students to end their strike.